Delicious by the shot: No mixers needed! Photo courtesy Blue Chair Bay Rum. While spiced rum has been around since the 1940s*, the more modern trend of flavored spirits began with vodka in the 1980s. The first flavored vodka, that inspired scores of other flavors, was Absolut Peppar, in 1986. Absolut Citron followed in 1988, and then the floodgates opened as Stolichnaya and other brands created their own versions. Absolut has launched 17 different flavors†; and newer brands like Pinnacle, Three Olives and Van Gogh focus only on flavored vodkas. Flavored tequilas arrived more quietly—first chile and coffee flavors and now, vodka-style, they’re branching out to fruit (we’re fond of El Jimador’s new Mango Mango and Mexican Lime). While the distillers of these flavored spirits provide plenty of cocktail recipes and expect bloggers and mixologists to develop many more, the plain truth is that they are delicious as shots. So today’s tip is: Enjoy flavored shots as you relax over the weekend (in moderation, of course). 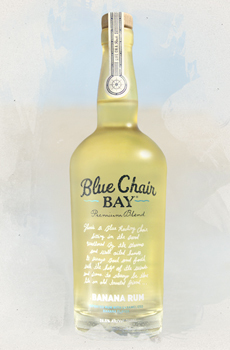 This weekend, we’ll be serving two tropical flavors from Blue Chair Bay, a brand created by singer Kenny Chesney. The line has four expressions: Banana Rum, Coconut Rum, Coconut Spiced Rum and White Rum (plain). At 53 proof (as opposed to 80 proof or higher with conventional rum and other spirits), Blue Chair Bay Rum is made for sipping straight. 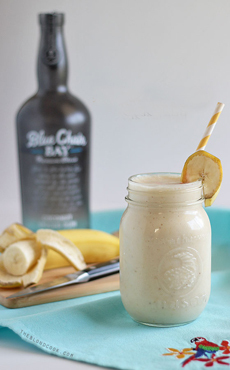 All three flavors are delicious, but as an avid fan of the Piña Colada, the Banana Rum captured our fantasy. It’s rum with caramelized banana flavor, but you’ll also find hints of coconut and plenty of sweetness. *The Levy brothers, pharmacists in Kingston, Jamaica, created the original recipe for aged spiced rum in the 1940s. The brand was purchased by Seagram’s (now Diageo) and marketed as Captain Morgan’s Spiced Rum. The spices include cinnamon, clove and nutmeg. The original Levy recipe also included medicinal herbs. †Absolut flavors, in order of launch: Peppar, Citron, Kurant, Mandrin, Vanilia, Raspberri, Apeach, Ruby Red, Pears, Mango, Berry Açaí, Wild Tea, Orient Apple, Grapevine, Cherrykran, Hibiskus and Cilantro. Note that flavored vodkas have been home-infused in Russia and elsewhere for centuries; but Absolut was the first flavored vodka sold commercially in the U.S.
Blue Chair Bay enlisted the help of selected bloggers to create recipes, which they sent to us along with a sample of the rum. 2. GARNISH and serve with a straw. Enjoy this one for dessert. Photo courtesy TheBlondCook.com. 1. PLACE all ingredients into a blender and blend until smooth. Pour and serve. For dessert, serve with chocolate cookies. Here’s something very creamy from ANightOwlBlog.com. Note that while it’s called a Martini, there’s nothing Martini about it (serving something in a Martini glass does not a Martini make). 1. COMBINE the rum, half and half and vanilla over ice in a shaker; shake to blend. 2. DIP the rim of the Martini glass in honey and then in coconut flakes for garnish. Add rum blend and serve. You can find more delicious recipes at BlueChairBayRum.com.